Ronan’s Jackson Duffey pulls ahead of the pack. 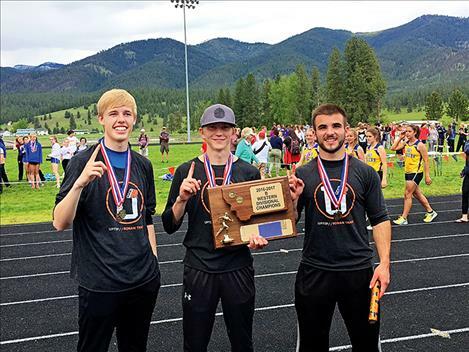 Ronan boys track team members pose with their 2016-17 Divisional Championship trophy. Lee Camel wins the long jump with a jump of 15 feet, 11 inches. 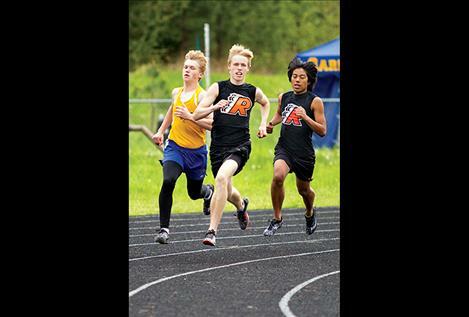 he Ronan boys clinched the Western B Divisional title on Friday. The Chiefs finished one, two and three in both the 800 and 3200. Jackson Duffey swept the distance races winning the 800, 1600 and 3200. Lee Camel won the long jump with a jump of 15 feet, 11 inches helping the Maidens to a fifth-place finish. 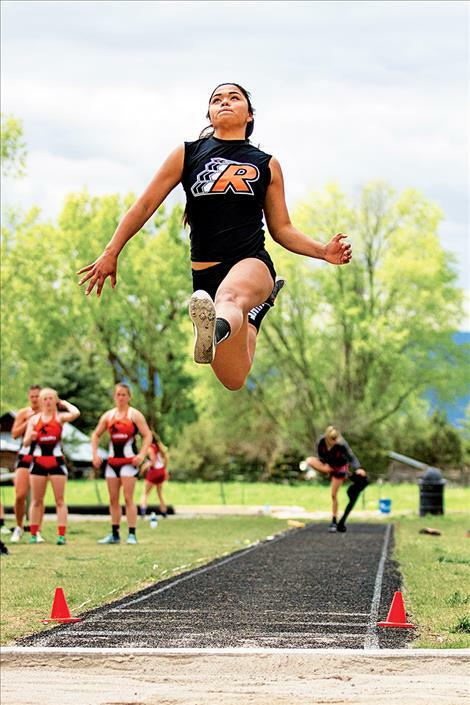 Mission Bulldogs’ Afton Brander finished in the top five in the long, high and triple jump. 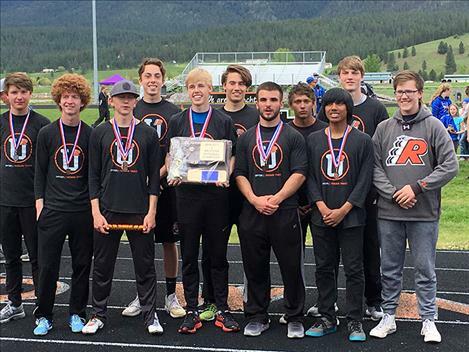 The top six placers in each event advance to the State B meet starting Friday in Butte. Team results: 1. Ronan, 101. 100 - 1. Jacob Byrne, LSH, 11.29; 4. Collin McGuyer, RON, 11.51. 200 - 1. Jacob Byrne, LSH, 22.67; 2. Collin McGuyer, RON, 23.15. 400 - 1. Jethro Throne, FLO, 51.30; 5. Steven Flesch, RON, 53.22. 800 - 1. Jackson Duffey, RON, 2:00.83; 2. James Normandeau, RON, 2:05.22; 3. Nathan Dennis, RON, 2:06.04; 6. Kiry Detwiler, RON, 2:07.16. 1,600 - 1. Jackson Duffey, RON, 4:38.25; 2. James Normandeau, RON, 4:45.40; 4. Nathan Dennis, RON, 4:47.81. 3,200 - 1. Jackson Duffey, RON, 10:30.26; 2. Nathan Dennis, RON, 10:36.33; 3. James Normandeau, RON, 10:36.52. 1,600 relay - 1. Bigfork, 3:34.58; 4. Ronan, 3:36.85. Pole vault - 1. Losha Schroeder, TF, 13-06.00; T-2. Collin McGuyer, RON, 11-06.00. Long jump: 1. Kellen Round, LSH, 20-05.50; 2. Gavin Strom, LIB, 20-00.75; 3. Cade Benjamin, PC, 20-00.00; 4. David Koppang, LSH, 19-06.00; 5. Jacob Byrne, LSH, 19-02.50; 6. Eli Smith, LIB, J19-02.50. Triple jump: 1. Danny Hoisington, TF, 41-03.50; 3. Steven Flesch, RON, 40-09.50. Team results - 1. Bigfork, 148; 5. Ronan, 47. 100 - 1. Haile Norred, BF, 13.01; 5. Kinsely Barney, RON, 13.48. 200 - 1. Haile Norred, BF, 26.11; 4. Kinsely Barney, RON, 27.66. 800 - 1. Bryn Morley, BF, 2:17.56; 5. Karolyna Buck, SI, 2:35.57; 6. Ashley McCready RON, 2;35.77. 1,600 - 1. Bryn Morley, BF, 5:00.39; 3. Ashley McCready, RON, 5;38.36. 3,200: 1. Anya Young, BF, 12:15.10; 5. Ashley McCready, RON, 12:54.00. 1,600 relay: 1. Bigfork, 4:09.30; 6. Ronan, 4:33.36. Javelin - 1. Mikayla Stone, PC, 113-09; 4. Micalann McCrea, RON, 103-00. Shot put - 1. Alye Fjell, PC, 36-08.00; 3. Lee Camel, RON, 36-04.00; 5. Kara Holmlund, RON, 34-03.00; Micalann McCrea, RON, 34-01.00. Discus - 1. Alye Fjell, PC, 120-10; 2. Micalann McCrea, RON, 111-09; 5. Nalani Linsebigler, MIS, 102-05.50. Long jump - 1. Lee Camel, RON, 15-11.00; 3. Afton Brander, MIS, 15-06.00. High jump - 1. Autumn Round, FLO, 5-02.00; 5. Afton Brander, MIS, 4-10.00. Triple jump: 1. Josee Applegate, PC, 34-04.50; 4. Afton Brander, MIS, 33-03.00.